Tesla’s second full-production model encounters hiccups early in the rollout process. 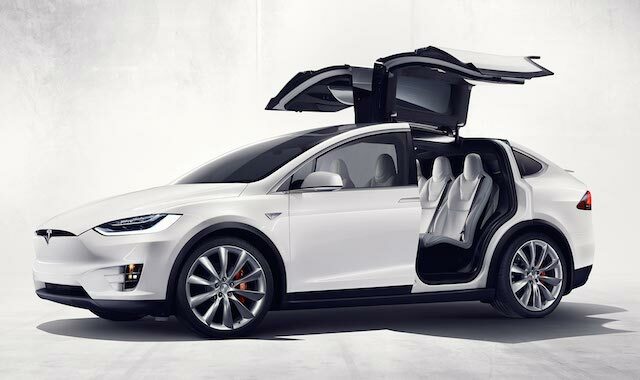 Tesla Model X (photo copyright Tesla Motors). The sheen is off of the Tesla Model X. The all-electric sport utility vehicle, introduced at the end of September 2015, was supposed to give Tesla a model rivaling the quality and the plaudits of the Model S sedan. Instead, what we have here is a vehicle that is falling short in the eyes of some, leading to many types of complaints from consumers. Indeed, those complaints cover everything from the rear falcon-wing doors to the huge infotainment screen, with the former failing to open or close and the latter reportedly freezing repeatedly. These and other problems are fixable and Tesla’s service staff has responded admirably thus far. What isn’t easily rectifiable is a design flaw. Specifically, the SUV’s distinctively constructed curved windshield distorts street lamps, headlights, and taillights at night according to Consumer Reports. As a result, drivers are finding themselves distracted and fatigued, unable to safely evaluate the distance between vehicles. First-year quality woes are not uncommon in the auto industry. In fact, experts including Consumer Reports routinely advise people to avoid such models until the kinks are worked out. Although only a few thousand Model Xs have been built to date, the problems seem magnified, especially as customers take to the message boards to share their complaints. The third-row seat latch can become undone and fold forward in an accident. This problem has resulted in a recall of 2,700 vehicles. Tesla blames its supplier for the mistake and says the supplier will pick up the cost of the repairs, what it expects to be completed on a rolling basis over the next several weeks. Some customers have also reported malfunctioning second-row seats, a problem that hasn’t been specifically spelled out. A discussion on the Tesla Motors message board indicates most respondents think the problem is exaggerated, although some agree larger sun visors are warranted. Uneven sheet-metal panel gaps is another identified problem, one that has previously dogged the Model S. Some of the panel gap complaints, however, seem attributable to pre-production models what may inadvertently raise the problem quotient of this model higher than it really is. Tesla has received praise for its AutoPilot hands-free driving capabilities, a feature that self drives the car. As long as the road line markings are clear, the SUV stays in its lane. In one report, a Model X owner said he was forced to take command of the steering wheel when the road’s shoulder ended as the SUV was not able to detect that. Like all manufacturers, Tesla Motors keeps people informed about all pending recalls. Service bulletins are issued to Tesla stores (dealers) and many repairs are handled at the local level. The company operates an Approved Body Shop Network, ensuring that all technicians are sufficiently trained to handle complex repairs, including aluminum welding. All Tesla models are covered by a 4-year, 50,000-mile new vehicle warranty and an 8-year unlimited mile drivetrain and battery warranty. Annual inspections are recommended or once every 12,500 miles. Like other manufacturers, Tesla also offers extended warranty plans of 3-, 4-, and 8-years. These prepaid plans cost $1,325, $2,100, and $4,000 respectively. In other Tesla news, the automaker claims more than 400,000 pre-orders to date for the Model 3. That’s far above the company’s expectations and the advanced orders don’t seem to be stopping. For customers desiring to order the compact sedan, a $1,000 fully refundable deposit is required. The number of pre-orders reflects global demand; American buyers who order and take delivery early, may be eligible for a $7,500 federal tax credit in addition to whatever state incentives may be available where you live.